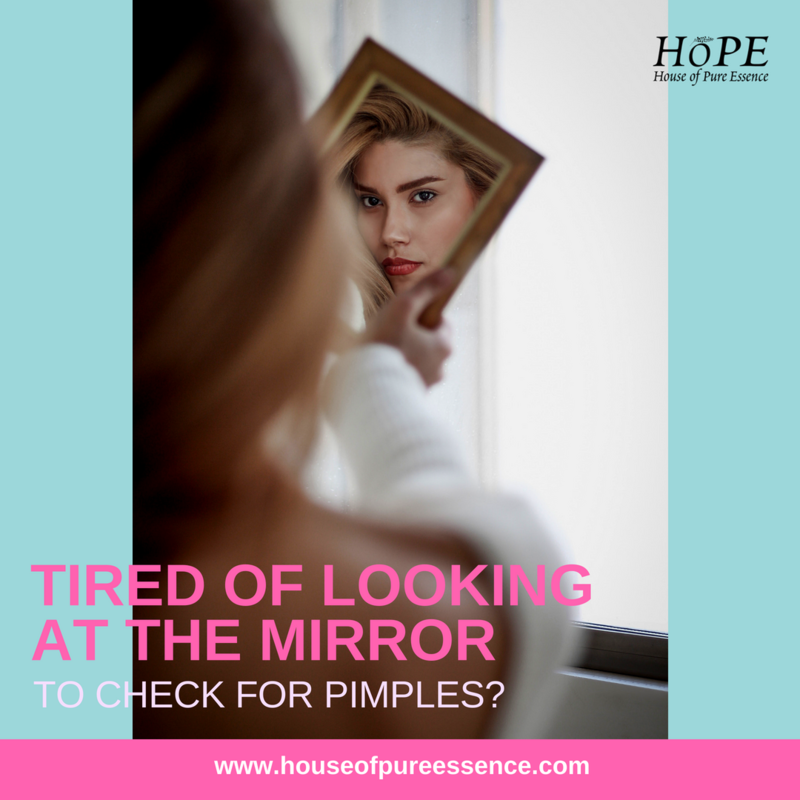 If you want to make sure that you have clear skin or if you want to do everything you can to make sure that you don’t have skin that is covered in blemishes or even marks then there are a couple of things that you can do about this. For example, we have a wonderful blemish-be-gone kit available! And you can find out all about it right here. 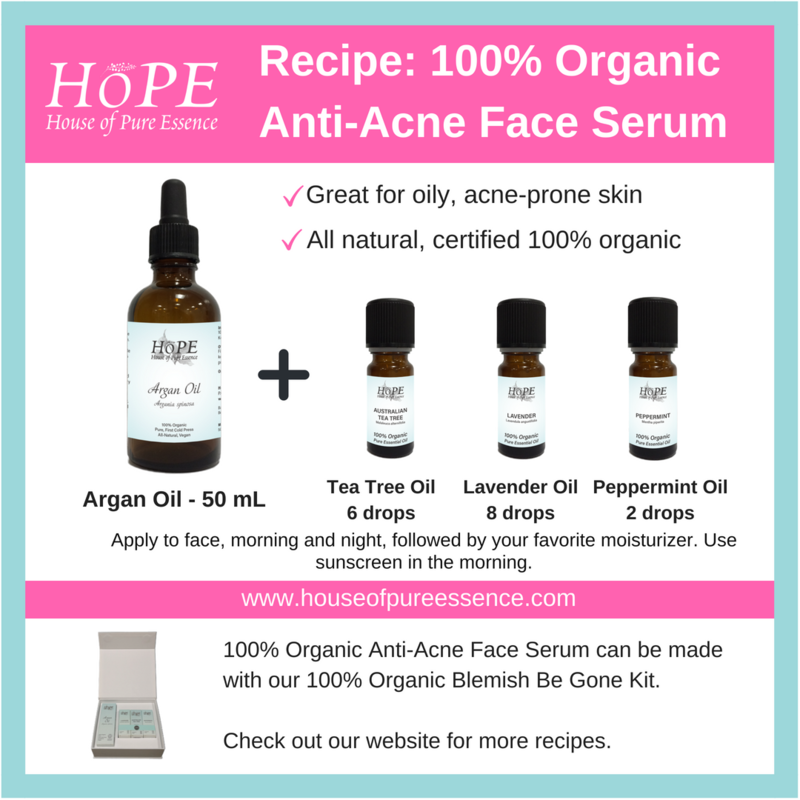 To make your Blemish Be Gone (Anti-Acne) Serum, all you have to do is open a full bottle of HoPE's 100% Organic Argan oil, then add 6 drops of organic tea tree oil, 8 drops of organic lavender oil, and 2 drops of organic peppermint oil. It’s important that all of the oils are organic because if they are not then they could contain a huge range of nasty chemicals and this is something that you’ll want to avoid. We always make sure that the oils that we have are organic and we also make sure that they are all natural as well. This ultimately means that the oils that you get are pure and they are also very good for you. In other words, you won’t get any oils that are better than ours! So how do you use your Blemish Be Gone (Anti-Acne) serum? Morning: After cleansing and toning, apply 4-6 drops to your face and neck. Follow with moisturizer and sunscreen (and make-up). Night: After cleansing and toning, apply a generous amount to face and neck. Follow with your night cream. Our cool tip: You'll find that your skin absorbs the DIY Blemish Be Gone (Anti-Acne) really well and make your skin feel dewy and plump. It's also non-comedogenic. This also helps with the absorption of your moisturizer. Do remember to apply your serum AFTER cleansing and toning and BEFORE using your moisturizer. Some also find it better to mix a few drops of the serum with their moisturizer. If you want to make your blemish spot (pimple) treatment, get an empty 10 mL roller bottle. Then add 15 drops of HoPE organic tea tree oil, 80 drops of HoPE organic lavender oil and 5 drops of HoPE peppermint oil. Mix well, then add 4ml of Argan oil. To use, simply apply problem spots as often as needed. You'll find that the pimples disappear rather quickly and doesn't leave your skin dry. Most over-the-counter pimple treatment dries out the skin. To make your very own (cold sore treatment, get an empty 10 mL roller bottle. Then add 15 drops of HoPE organic tea tree oil, 80 drops of HoPE organic lavender oil and 5 drops of HoPE peppermint oil. Mix well, then add 4ml of Argan oil. To use, simply apply to cold sores as often as needed. You'll find that the cold sores disappear rather quickly! Tea Tree Oil is a great antibacterial and anti-viral that's why cold sores disappear fast! If you noticed, the Blemish (Anti-Acne) Spot Treatment and Cold Sore Treatment are exactly the same! And this very same recipe can be used to treat small cuts and burns, even for children. One of our customers even commented that she uses this blend everywhere! It's truly a gem. It’s really important that you don’t use this treatment in large areas and the main reason for this is because it is rather potent and it could cause you to experience a skin reaction. You’ll also find that it can cause you to experience symptoms such as rashes and irritation, and this is something that you’ll want to avoid. If you use it as we have stated and if you follow our instructions, however, you’ll find that your skin will look better than ever and it is a great way for you to stop skin problems from coming back as well! If you want to find out more about our oils or if you are interested in making a purchase then please do get in touch with us today. We are always happy to work with you and we would love to tell you more about the oils that we have available. You can contact us either by phone or by email and this is a great way for you to find out everything you have ever wanted to know.